One of the most visually engaging videos was the one for the Crosby, Stills, Nash & Young-inspired mockery of meaningless business language, “Mission Statement.” Produced by animation company TruScribe, the video is animated entirely on whiteboards, with hands reaching into frame to add details that follow along with the song. 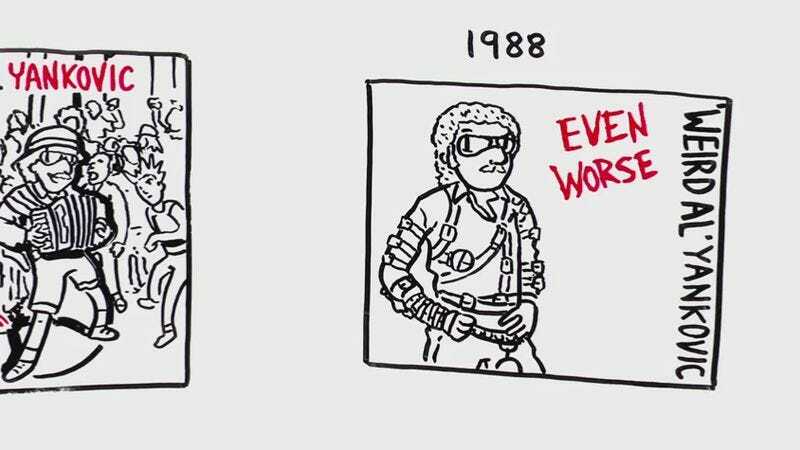 TruScribe apparently enjoyed working with Yankovic, as they’ve produced a short tribute video in the same style, drawing out lovely cartoon sketches of the covers for the beloved parodist’s 14 studio albums. Each album is accompanied with a clip from one of its singles, and it’s a neat reminder of just how many different songs and styles Yankovic has ably adopted and mocked in his 30-year career.